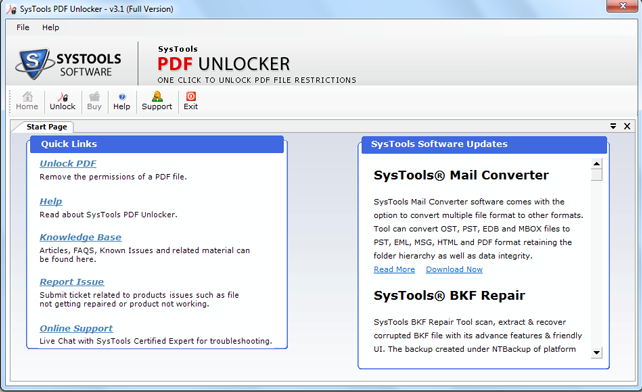 SysTools PDF Unlocker Software is a tool used to remove restrictions like printing, copying, extracting and editing the contents from Adobe Acrobat PDF files. The tool helps to remove both user and owner level security effectively from batch PDF files in one attempt. With the help of this tool, users can access PDF file contents according to needs and save unlocked PDF files to system hard drive for future assistance. Wrapped with user friendly interface, the tool is compatible with all Microsoft Windows versions including 8.1 and/or later versions. The size of the PDF Unlocker software is just about 3MB and works with low memory resources. In the terms of performance the tool is fast and executes reliable results to users without any kind of bug and/or complications. Demo Version: Demo version of the tool is available for free download at the SysTools PDF Unlocker Software official website. Via using trial version of tool users can unlock PDF files and save them into system but the software will watermark all PDF files as limitation. Full Version: Full version of the software is available into multiple licenses as per needs of users i.e. Personal, Business and Enterprise. Any of the versions can be purchased by contacting the support department of the organization. The activation key can be obtained within 24 HRS of making payment. Now click on ‘Unlock’ button and browse for the PDF files that are to be unlocked. When files are loaded with tool, it will display the permissions before and after applied on PDF files. In the next step select the destination location for saving the unlocked PDF files into system hard drive. Now click on ‘Unlock PDF’ option to remove restriction’s from PDF files. It will prompt error message after PDF files are unlocked as shown in below screen. In my opinion, I will say this is one of the best tools for unlocking PDF documents effectively. The results are outstanding and reliable too. All steps involved into using this tool is easy to operate, also precise. The software gives you the freedom to edit, print, decrypt, copy and access Adobe PDF documents irrespective of the restriction on them. This software review was submitted by James smith and published after trying the demo version of this tool. Feel free to share your own opinion about SysTools PDF Unlocker Software. You should use this third party tool to removes all local restrictions from the protected PDF file in just single-click. There are various such tools available which can quickly unlock your PDF files and make the content editable.You can also try this proficient tool http://www.pdfsecurityremover.org All it takes is just few seconds to remove restriction from a pdf file.this PDF unlock utility is an independent tool that does not require Adobe Acrobat to be installed on the computer system for performing PDF restriction removal.